One of my goals this year has been to read all the unread books that have been on my shelves since 2006. I’ve made good progress toward that goal, and I’ve enjoyed many of the books I’ve read in the process. The others—well, let’s just say I’m glad they won’t be sitting on my shelves making me feel guilty anymore. This book by Nicholas Ostler falls in the latter category. I actually received this book as a parting gift from coworkers at a previous job. The person who selected it knew that I had been studying Greek and that I was interested in language history in general. And it does seem like a great idea for a book. Ostler looks at world history through the lens of language—which languages are spoken where, how languages spread, and how languages die. His view is expansive. He covers ancient languages of the Fertile Crescent, the classical languages, modern languages, Eastern and Western languages. He doesn’t cover every language I’ve ever heard of, but he spends time with a good huge chunk of them, as well as with several I’ve never heard of. There’s discussion of Akkadian, Aramaic, Phoenician, Egyptian, Chinese, Sanskrit, Greek, Celtic, Gaulish, German, Slavonic, Latin, Spanish, Portuguese, Nahuatl, Quechua, French, Russian, and English. You can perhaps see where I’m going with this. How on earth could one book adequately explore all these languages? I’m not sure it’s possible, and I think Ostler tries to do too much in taking on this many languages, even if he wisely chooses not to give them all equal attention. This is a case of a nonfiction book that, in an attempt to be comprehensive, fails to be engaging. That’s not to say that Ostler doesn’t succeed at some points. I really liked learning that language spread isn’t always about who’s in power. Sometimes the dominant political force is not the dominant linguistic force. Take Aramaic, a language originally spoken by nomadic people who spread the language throughout the Fertile Crescent, thanks in part to forced dispersions at the hands of the Assyrians. Eventually, the language came to surpass the more elite Akkadian. With so many people speaking Aramaic, it was easier just to shift to that language, rather than try to educate the masses in Akkadian. Those facts stuck with me because Ostler was arguing a point when sharing them—that power does not equal linguistic dominance. At times, I thought Ostler’s main points got lost in all the details. I could see, for example, that he was trying to draw some conclusions about why some languages die in his chapter comparing Egyptian and Chinese, but for the life of me, I couldn’t figure out what those conclusions were. If I’d sat down and really studied the chapter, I might have sussed it out, but I didn’t care enough to put in that kind of work. And all too often, Ostler doesn’t even have a clear point to make, so the book becomes a dry recitation of facts. Eventually, this became enough of a frustration for me that I ended up skimming, looking for interesting bits. The book does lend itself to that kind of reading. Each chapter can be read in isolation without too much difficulty. I enjoyed the closing chapters on English, even though I hadn’t properly read most of the chapters immediately preceding them. Although Ostler is a linguist, this is more of a history book than a linguistics book. There’s not much information about how specific languages changed over time—the focus is on when and where they are used, not how the languages themselves evolve. That’s not necessarily a bad thing, but it’s worth knowing before you pick up this book. As I mentioned in my Sunday Salon post yesterday, I think there are nonfiction books that are great to read, and nonfiction books that are more suitable for studying. This book is definitely the latter, and I’m not really in a place right now where I want the latter. 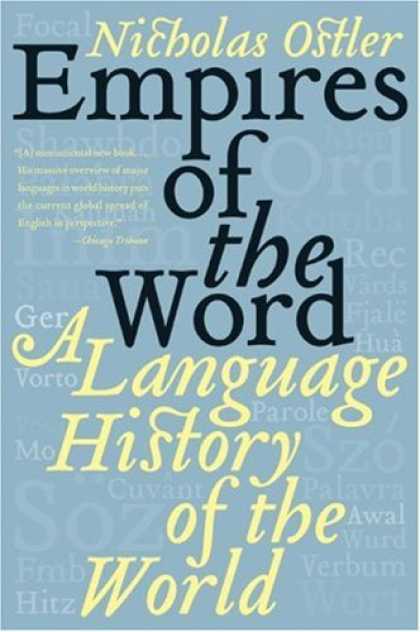 If you’re looking for lots of good information on language history, and you’re willing to invest the time, this book might be worthwhile. I’m so so sorry that this didn’t work. I kept staring at this when you had it on your currently reading shelf at goodreads and it sounded so good! I guess I will have to find another book on the subject that does a better job. I’d love to find such a book, too. I read The Unfolding of Language years ago, but I don’t remember much about it. My vague recollection is that it was pretty readable, but that’s all I remember. I have a handful of books about the evolution of English on my reading list, but I really think tackling so many languages necessarily makes the book disjointed enough to have chapters read independent of each other. I’m sorry this didn’t pan out! It does seem like one language is enough for one book. Covering so many just seems impossible to do well. I have yet to find a book about language that satisfies my heart, unless you count Simon Winchester’s two about the Oxford English Dictionary. It’s a shame because I am a languages geek, and most of the books about language I try are very dull – like a collection of facts (interesting facts, but still), rather than an argument. I still haven’t read Winchester’s books, although Meaning of Everything has been on my list for ages. I’m glad to hear you liked it. It does seem strange that experts on language aren’t better writers. Weird. I want to hear more about your quest to clean-up your TBR shelf. Does this mean read everything on your TBR shelf or just the stuff that has been there since 2006? It is making me think of all kinds of similar approaches for my own TBR pile. What if I read the ones that have been around the longest? Kind of interesting thought. But then again they have probably been around the longest because I’m just not that interested. But that isn’t always the case. Oh Teresa, I do love a project that I probably won’t finish…my head is spinning. The quest is not to read everything on the shelf (impossible!) but to read the books I’ve had for four years. My thinking is that if I’ve had them for four years and still haven’t read them I need to read them or get rid of them. Why keep them if I’m not interested enough to read them? I got rid of a bunch earlier this year and kept around the ones I still wanted to read. Now I’m down to four! Next year, I’ll tackle the unread books I got in 2007 (23 books in all). I saw this book somewhere not too long ago. I think it was at a library, but I had too many other books to check out. Glad I found someone else who read it, I can focus more time on studying other histories for my books instead. As a book to study, this might not be so bad, but I imagine there are better ones out there. I’ve tried all kinds of schemes to get through my TBR, but I liked the books I got in 2006 or earlier plan because it seemed manageable and was a good way to prioritize. (I’ve cheated in the past by, um, buying books and putting them on my shelf, thereby turning them into TBR books. Good for you for clearing off your shelves of all those unread books. I keep saying that I am going to do that and then I go to the library and check out a stack that I want to read first or go to the bookstore and buy more! I’ve been meaning to read this book, however, your review makes it sound like I wouldn’t like it. Thanks for allowing me to clear one off of my TBR list! There is something strangely relieving about being able to cross a book of your list, isn’t there?